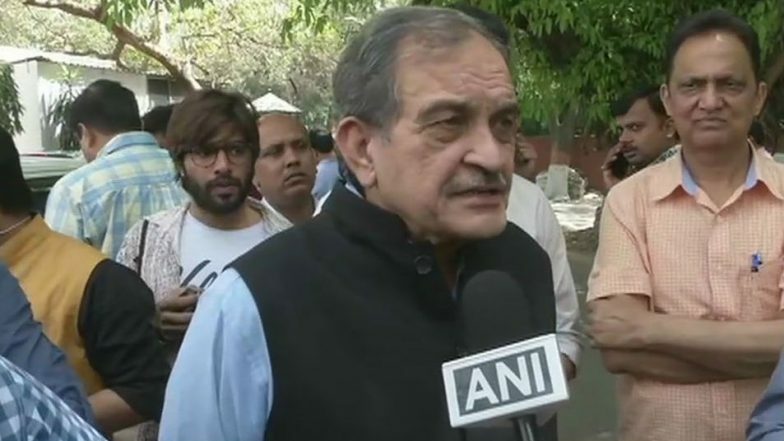 New Delhi, April 14: Union Minister Chaudhary Birender Singh on Sunday offered to resign from the cabinet and Rajya Sabha after BJP announced his son Brijendra Singh as the party's candidate from Haryana's Hisar Lok Sabha seat. Singh, who is Union Minister of Steel under the Narendra Modi government, said that he has offered to resign from the Rajya Sabha and ministership as the BJP is against "dynastic rule". BJP 20th List of Candidates for Lok Sabha Elections 2019 Out: Union Minister Chaudhary Birender Singh’s Son Brijendra Singh to Contest From Haryana’s Hisar; Check Constituency-Wise Names Here. "When BJP goes for elections, they are against dynastic rule, so I thought it to be proper that if my son gets the nomination, I should resign from Rajya Sabha and Ministership. I have written to Amit Shah ji, that I leave it to the party, forthwith I am ready to resign," Birender Singh told ANI. Earlier today, the BJP released the 20th list of candidates for Haryana, Madhya Pradesh and Rajasthan for the ongoing general elections. In the list, the BJP has announced two candidates for Haryana, three for Madhya Pradesh and one candidate for Rajasthan. The party also named one candidate for by-elections to the Uluberia Purba assembly constituency in West Bengal. Lok Sabha elections are being held from April 11 and will go on till May 19 in seven phases. Counting of votes will take place on May 23.